The Human-Centered Design Toolkit from IDEO.org gives you a set of tools to design an innovative and effective solution to the social problem you're trying to address. This page of Social Entrepreneurship Resources from the Harvard Innovation Lab features design help, business model planning support, and links to some of the world's thought leaders in social innovation. 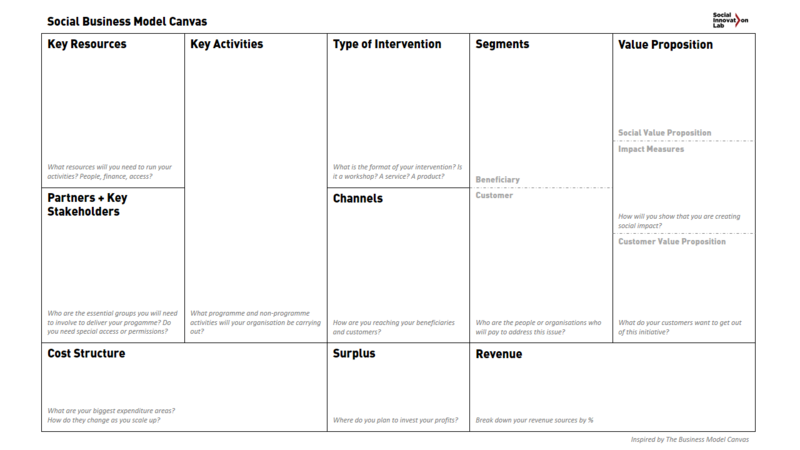 The Social Business Model Canvas, is a strategic management and entrepreneurial tool. It allows you to describe, design, challenge, invent, and pivot your social business model. This powerpoint from Harvard Business School professor Allen Grossman breaks down the important aspects of Developing a Social Enterprise Business Plan. REDF's Social Enterprise How-To Resources are a little bit technical, but they collect valuable best practices knowledge for the "nitty-gritty" aspects of your project. The Global Entrepreneurship Library houses hundreds of valuable resources for any stage of your venture development. Consider your business model, are you a pure business, pure nonprofit or a hybrid? Read Jim Fruchterman's short article, "For Love or Lucre." Four Lessons for AspiringEntrepreneurs, links to an article discussing how to how women entrepreneurs have successfully created start-ups by doing what they love to do. Canva inspires us with this article as to how to develop a pitch deck by learning from the early-stage pitch decks of 20 of today's most innovative companies.